While this has always been happening, the fact was this was a public moment where signifiers of understandings of blackness became central to the unfolding Dolezal saga. With social media following new angles, it was a unique experience connecting variants of blackness into this swirling concentric mass. And there was an undeniable celebratory cool factor thrumming through it all as folks rallied around those shared ideas of what it means to be black. Really be black. Blackness and coolness is nothing new. Black people have long embodied Black Cool, in a range of ways; many without even explicitly trying to do so. And there can be benefits to that: when you come from a little island somewhere in the world that a lot of people haven’t heard of, your familiarity with and understanding of black American pop culture and wider pop cultural references can be helpful. The knowledge might even surprise some folks. I’ve said before on social media that I didn’t feel as though Dolezal was appropriating me and my culture per se. 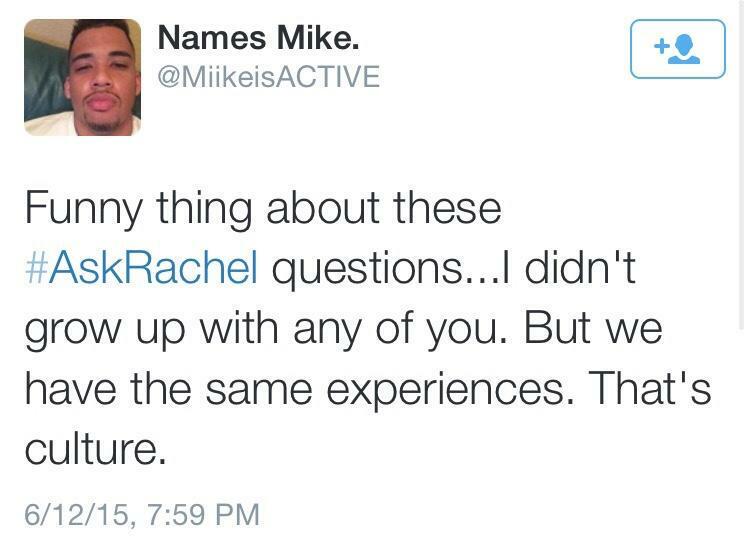 But many of my black American friends rightfully felt so, and I could understand their pain. However, inside of the memes, I simultaneously felt curiously enveloped and at home as I chortled my way through (re)affirmations of collective blackness. (Fun fact: I still haven’t ever watched the whole of Friday, but I’ve seen the salient parts and can successfully pass a meme quiz.) As with most things, there are levels to blackness, metaphorical and actual. When some Trinidadians make fun of the blackness of Tobagonians, it’s not unlike the maligning of Haitians, overtly or subconsciously, as “that kind of Black” — too black. In considering blackness levels, outside of the country, especially, Trinis never have to worry about being considered too black irrespective of how dark one might happen to be because of the narrative of mixedness that is well attached to our cultural identities. Especially in foreign, Trinis crow about how we are a racial democracy where no one is of any one race and deliciously, ‘we’re all mixed,’ and this is endlessly used to counteract U.S. framed discussions or experiences of race and racism. You might look pure black but you could be hiding a fair skinned Auntie or two for all anyone knew. And while for some people, aunties and uncles and parents of varying ethnicities really exist, the supposition of mixedness — the clamoring over and heralding of it and supplication to it — is always cloaked in anti-blackness. And there is plenty of unexamined anti-blackness spread all around the place, both in and out of the Caribbean. While racial purists on one side may wring hands over the inferior tainting of ethnic bloodlines, for Afro-descendants in many parts of the African Diaspora, there is generally the belief that through mixing, the race has been tweaked if not outright improved. Someone told me once that douglas are “always very pretty,” the belief being that an Indian mix improves upon blackness, softens and lengthens the hair and results in a phenotype marginally advancing (if at all) one side but always vastly superior to pure blackness. In Trinidad, anti-blackness might take several forms: seeing light “red” skin as the highest standard of beauty in both men and women, the presentation and commodification of Carnival into beauty and body aesthetics that privilege certain looks over others (buyers are also not encouraged to think about where some costumes are mass produced, at what raw cost, and who produces them for their good time), unduly blaming crime on one section of society with no equal examination of structural issues, referring to one group of people over and over as “lazy” while everyone else is industrious, police brutalizing poor black and brown bodies with impunity, disdain for daily paid work schemes and day labourers who are black and black immigrants from other islands. As Saidiya Hartman has reminded me, the issues of diaspora and diasporic blackness are an incredibly tangled, messy and beautiful business. The apogee of which is surely dependant on one’s purview and where and how your dark-skinned ancestors ended up whereever they did. Ghanaians wanted an escape from the impoverishment of the present, and the road to freedom, which they most often imagined, was migration to the United States. African Americans entertained fantasies of return and Ghanaians of departure. From where we each were standing, we did not see the same past, nor did we share a common vision of the Promised Land. The ghost of slavery was being conjured to very different ends. I live in the U.S. now, conscious of and ever curious about my examinations of blackness and the way that happens to me here in ways it doesn’t — and cannot, at home. How I feel like a stranger some days but really, like a cousin with a different accent on some others. The cousin who knew way more about you, than you about me. Still, I never felt landlocked into my pop cultural images of African Americans; I always knew on some level, possibilities for a wide range of blackness existed and have always existed because I existed, and black people existed in so many places that I knew of. A lot has changed, from me wearing my hair in plaits (which I always did at home) and having to tirelessly explain to confused black Americans that they weren’t dreads. Just plaits. Like my regular hair, but plaited up. No Trini of any ethnicity would ever make that mistake. Nowadays, my mother in Trinidad, enthusiastically follows South African soap operas along with Scandal. Generations is also shown and popular in Jamaica. There is a thriving and growing indie Caribbean film scene adding to the stream of U.S. made films. 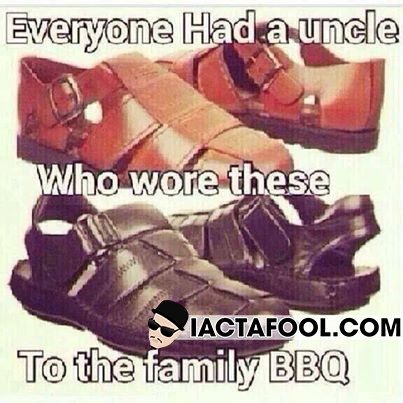 And The Black Uncle sandals? Well my Dad wears them. Along with a whole host of items straight out of the black American uncle handbook evidently. (Seriously, memes taught me this.) I don’t know whether this was some intrinsic taste borne out of black men over a certain age or what. Maybe they hold conventions about it and no one else knows. Who knows? Find me a man over a certain age in uncle sandals, in linen, or a shirt jack over three-quarter pants, or a two-piece set of both; with a thick gold bracelet, or still using Afro Sheen or Blue Magic, and he might be a certain kind of black man, possibly from anywhere inside the African diaspora. * On my mother’s side, there actually is a family reunion held in Guyana — though I’ve never been. One day I will go and see if it’s anything like this. This entry was posted on July 11, 2015 at 7:50 am and is filed under culture, feminist, identity, trinidad. You can follow any responses to this entry through the RSS 2.0 feed. You can leave a response, or trackback from your own site.